Tiffany Marble Molds manufacturing franchise business opportunity. Free Tiffany Marble Molds manufacturing business franchise information. Tiffany Marble Molds International Inc. offers award-winning molds, formulas and complete factory training to get you started in the world of Tiffany Marble manufacturing. The many molds and formulas offered by Tiffany Marble Molds Int’l, Inc. are designed to produce a complete line of elegant Tiffany marble products for the new construction and remodeling industries. 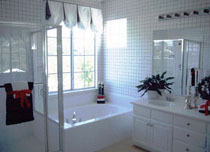 Products include wall paneling, bathtub and shower surrounds, bathtubs, window sills, fireplace mantels and facing, custom durable kitchen counters, and bathroom vanities of various styles and sizes, as well as floor and wall tiles. Our molds also produce many additional elegant marble products such as fine quality marble wastebaskets, three sizes of planters, assorted marble, onyx, or granite tables including conference tables, and desks. The marble industry has virtually exploded in the last few years. Tiffany Marble manufacturers today are selling an average of 7 times more Tiffany Marble, Tiff-Onyx and Tiffany Granite per home than just a few years ago. 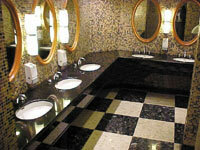 You, as a Tiffany Marble manufacturer simply produce the elegant products, and wholesale to your customers. Tiffany Marble Molds Intl., Inc. sells molds to customers worldwide and assists in establishing Tiffany Marble factories in their respective areas. Complete in-factory training is included with mold package purchase at training facilities on the East and West coasts of the <?xml:namespace prefix = st1 ns = "urn:schemas-microsoft-com:office:smarttags" />U.S. and Canada. Every mold package purchase includes extensive video tapes and manuals, factory planning materials, and complete, hands-on, in-factory training on all our exclusive Tiffany Marble formulas and techniques. There are various mold package programs which cater to the needs of the housing, industrial, commercial and construction industries. Tiffany Marble Molds Intl., Inc. also offers molds to produce hundreds of gift-ware items that can be wholesaled to many types of retail outlets. To learn more about the Tiffany Marble Molds manufacturing business opportunity, simply complete the form below.